During WWII, a platoon of American soldiers trudge through the Italian countryside in search of a bridge they have been ordered to blow up, encountering danger and destruction along the way. A managing editor of a LA newspaper must put together headlines for the next day in a way that'll attract the potential readers, deal with hectic going-ons at the workplace and have a serious talk with his wife about her wish to adopt. Two brothers, a police officer and a boxing promoter, vie for the affections of a lovely young woman. Sergeant Warnicki: That reminds me of W.C. Fields' sure cure for insomnia. Get plenty of sleep. The film is now available after years of litigation. 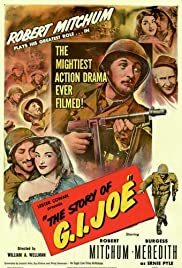 I found this to be a particularly poignant film about WWII - no heroics, just the simple getting through the day & night of a company of US infantry. Much like Ernie Pyle humanized the 'G. I.' in his written pieces, Wellman does the same on film. The heat, dirt, cold, mud, rain...fear, uncertainty, waste - it's all here without the bombast and manipulation of "Saving Private Ryan'. The performances are wonderful - most of the performances were given not by professionals but by the soldiers themselves. There is one scene between Mitchum and Meredith that was apparently an audition film - it was so right, it was simply inserted into the film. There are human touches throughout, as well as the insanity of war. I would strongly recommend this film to anyone who has an appreciation for the director, actors, theme. It's not a grisly film, and it is slow, but overall well worth watching.